I’ve been considering what to make my first post about, and decided that since many are refighting the Civil War, or the Southern War of Independence, War of Secession or whatever you want to call it, a proper subject would be my ancestral graveyard in West Tennessee. My great-great grandfather, Jesse H. Carter migrated from Fishing Creek in South Carolina to West Tennessee sometime around 1830 or perhaps possibly earlier. He and a couple of his brothers and cousins their families settled in Carroll County. Jesse became a wealthy landowner who is believed to have owned several hundred, if not thousands, acres of land in and around the Obion River bottom south of McLemoresville. The Carters and their McKinney cousins were devout Methodists but there were no Methodist congregations (or congregations of any kind) in the vicinity. They started meeting in a brush arbor on my great-great-grandfather’s land and eventually erected a church and graveyard on land he donated. Carters Chapel Methodist Church is still an active congregation and the cemetery is still in use. Many of my ancestors and relatives are buried there although my parents are buried in another cemetery a few miles to the south in the community where they lived. A number of years ago my wife, then my girlfriend, and I visited the cemetery and spent an hour or so looking around. We had just stopped at Fort Harrod in Kentucky on our way down to Tennessee. I noticed some graves marked with sandstone in the same manner as the graves at the fort. 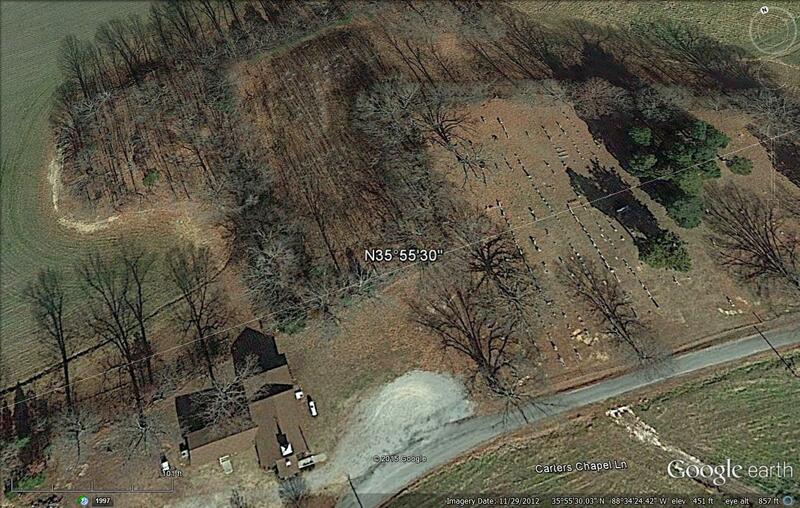 I suspect they are the graves of the early settlers although my family claims they are graves of slaves. That’s not what this post is about. I also noticed a number of graves in the cemetery with white markings identifying the person whose remains are buried beneath them as a member of the Grand Army of the Republic, an organization of veterans of the Civil War. Some, if not all, of them identify the person as a veteran of the 7th Tennessee Cavalry. At the time, I didn’t know that the 7th Tennessee was a Union regiment (I probably knew but had forgotten.) There are also graves in the cemetery of men who were on the other side, although their graves aren’t marked to identify them as having been Confederate veterans. Americans today think that the Civil War was between North and South. In reality, it was between those who supported the Union and those who supported the right of the Southern states to secede. Yes, slavery was part of it but Abraham Lincoln didn’t raise an army to send south to free the slaves. His intent was to repress what he saw as a rebellion. After all, Confederates were called rebels. The Union Army included Southerners, large numbers of them, like the men buried in those graves. These particular veterans were men who enlisted in a regiment organized by Isaac Hawkins, a lawyer and slave owner from nearby Huntingdon, the county seat. Hawkins’ cousin was an officer in a Tennessee regiment serving under the legendary Nathan Bedford Forrest. In fact, the 7th Tennessee Cavalry (CSA) captured the entire 7th Tennessee Cavalry (USA) at Union City. After Union officers refused a prisoner exchange, the West Tennessee Union men went to Southern prisons, particularly one at the tiny Georgia town of Andersonville where many of them died of disease aggravated by malnutrition. It was hard to feed prisoners since Sherman’s men had stripped the region of all food a few months before. Some of the 7th Tenn. (USA) veterans are my relatives although not all of them were still in the regiment when it was captured. One of my relatives, John Carter, spent a year in the 7th Tennessee but got out at the end of his one-year enlistment. He, like the rest of the 7th Tennessee (USA) was captured at Trenton. That time, the prisoners were exchanged. My family has been in what is now the United States since the earliest days of the European immigration. Although my branch of the Carter family can only be traced back to the 1700s in Virginia, they are most likely descended from the Carters who established a plantation at Jamestown then spread out of from there. Jesse Carter’s wife Betsy, my great-great-grandmother, was descended from a German Anabaptist who immigrated to Pennsylvania then moved south to the Carolinas and from a Scottish immigrant who also settled on Fishing Creek. My McGowan ancestor was born in London but his father was a Scottish Baptist preacher who had settled in England after fighting with Bonnie Prince Charley at Culloden. (My maternal ancestors are not part of this particular narrative.) However, it wasn’t until late in the 19th century that my McGowan great-grandfather came to West Tennessee and pastored Carters Chapel, and his son met and married my grandmother.) I honestly don’t know if the Carters and McKinneys owned slaves or not. There’s no doubt that their ancestor, Alexander Carter, owned slaves in South Carolina. For years I didn’t think they did primarily because one elderly Carter woman who wrote a narrative about them said they were Union men and later Republicans. I think the latter is true but I’m not sure that all of the Carters supported the Union. I know my grandfather was a strong Republican but, then again, his father came from Middle Tennessee (and his grandfather was probably a Confederate soldier, although he never knew him.) I’m not sure about my grandmother. The 1860 slave census shows very few slaves in that part of Carroll County. The Civil War centennial started while I was in high school but I don’t remember there being any attention paid to it. A famous battle was fought only about 10-12 miles from where I grew up, but although there’s a park there now, it wasn’t established until recently. If any of my classmates’ fathers were members of the Sons of Confederate Veterans, I never heard about it. If there were any Klan members around, they stayed hidden. (One of my maternal great-grandfathers was active with the Klan in the early Twentieth Century but I was in my 50s before I ever heard anything about it. I spent a lot of time with my grandmother but she never said anything about it.) I was stationed in North Carolina, Georgia and South Carolina but except for Charleston, where Civil War cannon overlook the harbor in Battery Park, there was very little homage paid to the war. I knew no one who displayed the Confederate flag, not even the guys, most of whom were from the north, who weren’t particularly fond of blacks. Back to Carters Chapel – the people who lie buried in that cemetery are Southerners, Yet many of those who were alive at the time who lie in that graveyard supported the Union. Others didn’t. After the war, there was some animosity among the men who went to Andersonville but within a generation, families were intermingling. I have friends whose families lie in that cemetery who were staunch Democrats but I have more friends who were from Republican families. None of them wave the Confederate battle flag. As for myself, I have never owned a Confederate flag of any kind. My first wife was from Virginia and while her mother was from New Jersey and the granddaughter of a Union naval officer, her father was a Virginia native. They had a Confederate flag that had belonged to an ancestor. If I remember correctly, it hung in the sunroom. My homosexual VMI graduate brother-in-law got it and later sold it. My wife’s grandmother’s house in New Jersey had two .45 revolvers and her (or her late husband’s) sabre in the sun room. Yet even though I have no particularly affection for the flat of the Army of Northern Virginia, I am very disturbed by the big flap raised by political activists, the media and the Indian governor of South Carolina who has no connection to the heritage of the state she was elected to govern. The years 1961 to 1965 will mark the one-hundredth anniversary of the American Civil War. That war was America’s most tragic experience. But like most truly great tragedies, it carries with it an enduring lesson and a profound inspiration. It was a demonstration of heroism and sacrifice by men and women of both sides who valued principle above life itself and whose devotion to duty is a part of our Nation’s noblest tradition. Both sections of our now magnificently reunited country sent into their armies men who became soldiers as good as any who ever fought under any flag. Military history records nothing finer than the courage and spirit displayed at such battles as Chickamauga, Antietam, Kennesaw Mountain, and Gettysburg. That America could produce men so valiant and so enduring is a matter for deep and abiding pride. The same spirit on the part of the people at home supported and strengthened those soldiers through four years of great trial. That a Nation which contained hardly more than thirty million people, North and South together, could sustain six hundred thousand deaths without faltering is a lasting testimonial to something unconquerable in the American spirit. And that a transcending sense of unity and larger common purpose could, in the end, cause the men and women who had suffered so greatly to close ranks once the contest ended and to go on together to build a greater, freer, and happier America must be a source of inspiration as long as our country may last. By a joint resolution approved on September 7, 1957 (71 Stat. 626), the Congress established the Civil War Centennial Commission to prepare plans and programs for the nationwide observances of the one-hundredth anniversary of the Civil War, and requested the President to issue proclamations inviting the people of the United States to participate in those observances. Now, Therefore, I, Dwight D. Eisenhower, President of the United States of America, do hereby invite all of the people of our country to take a direct and active part in the Centennial of the Civil War. I request all units and agencies of government–Federal, State, and local–and their officials to encourage, foster, and participate in Centennial observances. And I especially urge our Nation’s schools and colleges, its libraries and museums, its churches and religious bodies, its civic, service, and patriotic organizations, its learned and professional societies, its arts, sciences, and industries, and its informational media, to plan and carry out their own appropriate Centennial observances during the years 1961 to 1965; all to the end of enriching our knowledge and appreciation of this momentous chapter in our Nation’s history and of making this memorable period truly a Centennial for all Americans. DONE at the City of Washington this sixth day of December in the year of our Lord nineteen hundred and sixty, and of the Independence of the United States of America the one hundred and eighty-fifth. I decided to start a Word Press blog on a whim. Actually, I should be in bed but I saw someone else’s blog and decided to start one of my own rather than posting my thoughts on my own web site (www.sammcgowan.com). I’ve got a lot to say about a lot of things. We’ll see how things go. I’ve slept on this and am going to update the post. First, let me tell you a little about me. My name is Sam and I grew up in West Tennessee (not west Tennessee, it’s a proper name.) I’ll be 70 my next birthday. Right after my high school graduation in 1963, I enlisted in the Air Force and spent 12 years. No, I did not retire – that takes 20 years. I just got out because I was tired of military politics. Unlike the majority of Air Force “airmen”, I actually flew. I started out in aircraft maintenance then became an aircraft loadmaster and spent 11 of my 12 years on aircrew duty. I saw a lot of the world, particularly Southeast Asia. I am what the media likes to call a “decorated combat veteran,” whatever that means. After my first marriage, my new wife and I decided we wanted to become involved in church. She was Episcopalian and I had been raised Southern Baptist. We joined an independent Baptist church in Dover, Delaware and our lives changed drastically. I had already decided not to reenlist so I got out in July 1975 and we went back to Tennessee, back for me at least since my wife was from Virginia. That marriage lasted almost 20 years. My current – and last – wife is a Chicago native who became a transplant to Texas, where we now live. While I did not graduate from college, I have enough credits that I probably could had I elected to. Although I was unable to take off-duty courses for my most of my time in the military, I was able to take some during my last year or so before I got out, courses in aviation management. After I was discharged, I enrolled at Tristate Baptist College in Memphis where I studied systematic theology and the Bible. Some would say I am an accomplished author since I’ve authored, what, ten books? Right now I’m working on two more. When I was a little boy, I decided I wanted to fly airplanes when I grew up. While stationed on Okinawa, where I rarely spent more than three days at a time, I started taking flying lessons but didn’t solo until I returned to the States in 1967. Over the next 43 years I logged over 16,000 hours in the air as a pilot, most of it professionally. I started flying corporate jets in 1991 and flew them until I quit flying for medical reasons in 2010. My politics are what many call “classical liberalism,” the political philosophy that goes back to John Locke. The main principle of classical liberalism is limited government. While I believe in the rights of the individual, I’m not into the modern concept of “group identity.” My ancestors date back to the 1600s in America, some of them at least. Some go back at least 15,000 years. My ancestry is Scottish, Irish, German, English – possibly Welsh – and Cherokee. My great-grandmother was at least half Cherokee and probably 3/4s. I do not like the term “native American.” Any child born in America is a native. Although I grew up in the South, my parents were Republicans, my dad all his life and my mother from right after they were married. My mother came from a family of Democrats, some of whom would have voted for Satan if he ran on the Democratic ticket. When I was in my 50s, I learned that one of my great-grandfathers was a night-rider. I suppose that means he was active in the Klan, the rejuvenated Klan, not the original. My parents were in favor of school integration. However, after blacks started marching and making demands, they became less enthusiastic about the “civil rights movement.” I am all for rights for everyone but I oppose special treatment for someone just because they happen to be of a particular ethnicity or race or have some kind of sexual quirk. I do not own a Confederate flag, never have and never intend to own one but I don’t believe it is a “hate symbol” nor do I believe the men who fought for the South and the women who supported them are “traitors.” There is a movement among Northerners today – and some Southern Democrats – to marginalize the South although I don’t really know why unless it is due to jealousy. I plan to blog about all kinds of things. Some posts may be political but most will not. This will be my place to vent and take time off from my writing.